Well, Baldur's Gate II: Enhanced Edition is finally out and I've dug right in, continuing the adventures of my half-orc avatar across the western coast of Faerûn. While I'd had some (incomplete) experience with Baldur's Gate prior to trying BGEE, this is my first time playing Baldur's Gate II (aside from a short demo) and I know far less about the story to come than I did when chronicling BGEE. It will be interesting to see if that has any effect on my estimations of the game in comparison with its predecessor. BG2EE certainly starts off with a bang. Explicitly assuming that you've played through the previous story, BG2EE throws you right into the action by having you kidnapped by a powerful mage named Jon Irenicus, who evidently believes your heritage as the spawn of Bhaal makes you useful to his as of yet unstated purposes. 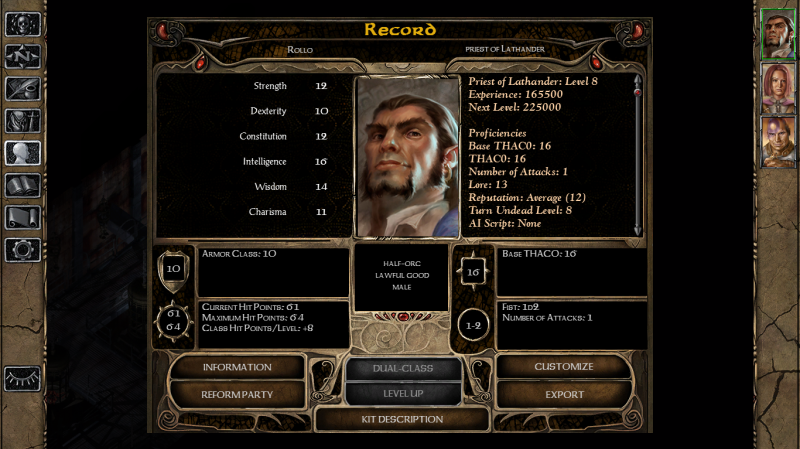 He seems quite the powerful fellow but fortunately the player's childhood friend Imoen is able to help you escape, along with former companions Jaheira and Minsc, though Khalid and Dynaheir do not survive their internment. The bounty hunter Yoshimo, from the far-away continent of Kara-Tur, joined me as well and together he and my party made our way to the surface of Athkatla, Amn's capital, though not before Irenicus and Imoen were abducted by the city's cabal of mages for the unregistered use of magic. My goal at this point - at least in comparison to the beginning of Baldur's Gate - is pretty clear: rescuing Imoen. That's going to be pretty tricky, however, considering that the only person who seems to know how to do so wants 20,000 gold pieces for the job. And thus is established my incentive to engage in the game's many, many side quests and character stories, in order to obtain the wealth (and experience) necessarily to actualize Imoen's salvation. I'm not very far into the game yet (though I have been playing it quite a bit), but I've already noticed some pretty big difference between it and its predecessor. For one thing, the interface (designed by Madolin Bee) is pretty significantly different. Not only does it look different, but it functions differently as well in some small but important respects, though I described some of these changes already in my report about BGEE's v1.2 patch, which brought some of these changes over to BGEE. And while the gameplay of BGEE was already tweaked to more closely resemble its sequel, there are still a few differences in BG2EE, such as the wider set of AI settings now available. The biggest difference, however, is probably the way in which the characters of Baldur's Gate II interact with you. One of my biggest complaints about Baldur's Gate - which BGEE addressed to some extent - was that the characters felt very flat and uninvolved in the game's story. That is far from the case in BG2, which provides every character I've recruited so far with a vibrant personality and a lot to say on the game's plot. Additionally, BG2 has added character quests as well, which have so far actually operated the majority of my attention. Indeed, the game almost goes too far in this direction as I've increasingly found myself overwhelmed by my party's needs. It has become a common occurrence at this point for a new character quest to pop up while I am still in the midst of performing another and already have one or two backed up, which wouldn't be so much of a hassle if it weren't for the fact that every character considers their quest an immediate priority (and actually quite reasonably in most cases) that puts their loyalty at risk if I don't solve it quickly. This has made questing a bit more anxiety-ridden than it was in BG1, but to be honest I'll take demanding and responsive NPCs to accommodative and mute ones any day. Most of this is the result of BioWare's own improvements to the series when the game was originally released and shows the company's increasing maturity as an RPG developer. That's not to say, however, that Beamdog has been lax in their responsibilities as the series' new caretakers. Like BGEE before it, BG2EE had a truly substantial amount of new content, including 4 new companions, 3 of whom (Neera, Dorn, and Rasaad) were featured in BGEE and 1 (Hexxat) who is entirely new to BG2EE. I've only just recruited Neera and have yet to re-encounter Dorn and Rasaad, but Hexxat has already proved a most interesting addition to the game, with a storyline that carries at least one genuine surprise so far. That's really all I have to say for now but I can say with real sincerity that I'm looking forward to completing the Bhaalspawn saga as I progress through Shadows of Amn and then Throne of Bhaal. BGEE was an unexpectedly fun adventure and BG2EE already looks to improve on it substantially. If I'm right, it may yet be one of the best RPG experiences I've had for some time.